Although I’m fond of tidy, highly structural gardens, mine doesn’t make that list. I do have many non-fussy anchors, but I wouldn’t be content with an essentially static garden. I’m a drama queen and I like surprises! This sure was a surprise: my Iceberg rose blooming its head off with thryallis and cenizo. That group only gets water once a week in summer if rain veered past us (yet again!). A few years ago, I replaced the red tip photinias in this AC side yard with these and other sun lovers that I relocated from too much shade. This part of the back “prairie” is in riot-mode with milkweeds, Turk’s caps, pavonia, lantana and passionvine. It’s a wildlife riot, too! Old-fashioned fragrant petunias in patio containers are heading into summer break, though not quite ready to give up their perfumed performance. I’ve been cutting them back a little and feeding with a seaweed/fish emulsion/molasses drink which they appreciate. In a fence bed, this spring I added some red billbergias. They get shade mixed with blasts of sunlight. I just love this color and their tidy form that so beautifully complements the spilling plants beyond them. On CTG this week, that’s just one of many plants that Tillery Street Plant Company’s Jon Hutson highlights in his talk with Tom. I’ve known Jon since he ran innovative Floribunda in south Austin. We were thrilled when he opened equally innovative Tillery Street in east Austin! It’s just across the street from Boggy Creek Farm and down the street from Springdale Farm. Since many talented artisans have located nearby, this is the latest go-to place for food, plants, and art! On CTG, responding to viewer requests, Jon combines structural and softer forms for sun and shade. He explains how to diversify our gardens with drought-tough companions that strengthen our designs with contrasting forms. Get Jon’s list for outstanding additions from upright yuccas to floppy yellow firecracker fern and silvery native groundcover woolley stemodia. I grabbed this shot at Mueller on a cloudy morning. In sunlight, its silver absolutely shimmers! Another on his plant list is foxtail fern. Mine (this one in a pot) are soft-structure perfect in psycho lighting: dry shade peppered with a brutal spear of afternoon sun. Beyond are inland sea oats and potato vine (Solanum jasminoides) on an obelisk. Jon brings along a Mangave ‘Bloodspot’, a cross between Manfreda and agave. Since these are great non-fussy structures, Daphne makes Manfreda our Pick of the Week with her insight and planting tips. 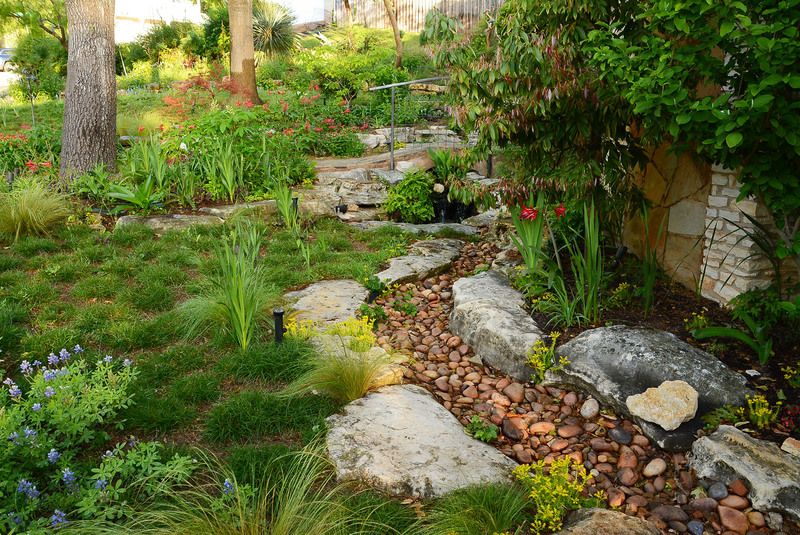 Gardener Brent Henry has clay soil, so he mixes in decomposed granite to improve drainage. His Manfredas get partial sun with most of the sun in the afternoon, but shaded by a bur oak. Gardener Matt Jackson snapped these pictures of native Manfreda virginica for CTG. When I first heard about ‘Macho Mocha’ years ago, it was considered a Manfreda. By the time Pam Penick divided some of hers for me, it was categorized as a Mangave. Whatever. You’ll see them as both names. As Daphne tells us, the native Manfreda maculosa is considered the Texas tuberose. That’s on my list! So, once you have your structural succulents, how do you divide these vigorous plants? Eric Pedley from East Austin Succulents shows us how. In 2011, Eric met with CTG for astounding design ideas with succulents. Now, he’s joined spaces with Jon’s Tillery Street Plant Company. In one visit, you can fulfill your garden dreams, encouraged by two hard-working home-grown owners who are passionate about plants and ready to share their knowledge with you. To complete our east Austin tour of innovative ideas that combine structure with softness, take a tour of Lee Clippard and John Stott’s garden. Many gardeners, like Russell Bauer, have asked us about blossom end rot! Daphne explains why this happens and what you can do. Thank you to Dr. William Johnson, Texas Agrilife Extension/Galveston for sharing his picture! Usually, the second crop comes out clean, as Russell shows us with his second harvest. Certified Backyard Habitat gardener Susan Brock shares this picture from her organic garden: another reason to diversify your garden. Cardinals selected her Knock Out to raise a new family! ← Creating Tomorrow’s Garden Today!